KIEV, Ukraine -- Demonstrators protesting proposed tax law changes they say will cripple small businesses defied authorities Tuesday and set up a small tent camp in the center of the Ukrainian capital. 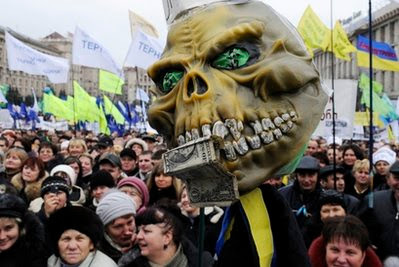 Protesters hold a mask of a monster symbolizing Ukraine’s tax police at a rally in central Kiev, Ukraine, Monday, Nov. 22, 2010. Some thousands of angry Ukrainians protested a tax bill on Kiev's central square, that would increase taxes for small enterprises, which they say would bankrupt them. Stomping their feet and dancing under soaking rain to warm themselves up, several hundred protesters vowed to stay on Maidan square until the authorities rescind a bill that raises taxes for small and medium size businesses. The protest is part of a series of demonstrations that have drawn thousands, threatening the popularity of President Viktor Yanukovych, who took office in February. The half-a-dozen tents echoed the massive encampment of the 2004 Orange Revolution mass protests. A Kiev court on Monday banned rallies in the city, saying they would disturb visits by foreign delegations. Protesters say the tax reforms would hurt businesses by depriving them of tax breaks. The government says the changes are necessary to increase government revenues after the economy contracted by 15 percent last year. Kiev police spokesman Volodymyr Polischuk told The Associated Press that government representatives were expected to officially inform the protesters of the ban later Tuesday and ask them to dismantle the camp. He would not say whether the authorities would resort to force to break up the protest. Parliament adopted the tax bill last week, but Yanukovych is hesitant to sign it, fearing it would take a serious toll on his popularity. He vowed to meet with the protesters this week and take their demands into consideration. One of the protesters, a 50-year old owner of a clothing stall at Kiev outdoor market, said the proposed tax code would bankrupt his business. "I am standing here for freedom, for truth and for the right to do business," said the man, who gave his name only as Stanislav, fearing reprisals by authorities. Ukraine's tax system ranks among the three worst in the world, according to a study of 183 nations conducted by the World Bank group. Some experts say that the new tax code may actually decrease government revenues by pushing many businesses into the shadow and will fuel corruption among tax police by giving tax inspectors too much power while inspecting firms.